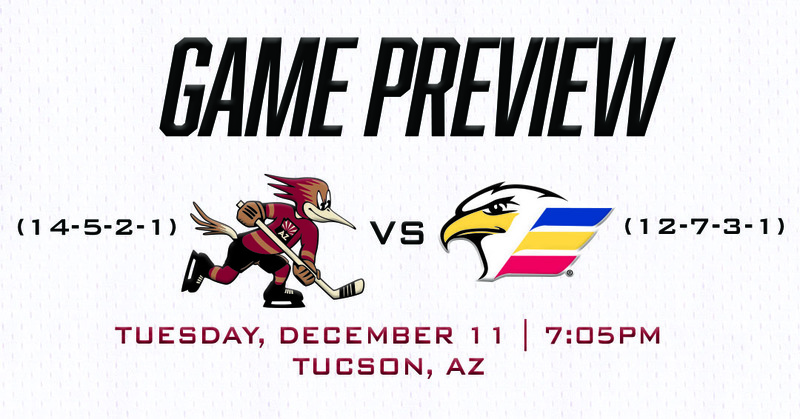 It’ll be a battle between two of the American Hockey League’s hottest teams tonight at Tucson Arena when the Roadrunners host the Colorado Eagles for the first time, marking the third of the teams’ 12 scheduled meetings this season. The top of the Pacific Division is absolutely rolling; the Roadrunners (5-0-2-0) and Eagles (6-0-0-1) are both on seven-game point streaks, while the San Jose Barracuda (6-0-1-1) are with points in each of their previous eight. The Barracuda have not been held without a point since they were swept via consecutive shutouts by the Roadrunners at Tucson Arena on November 9 & 10. The Eagles have earned more points than any other team in the Pacific Division on home ice (21), but have struggled to find consistency on the road, going 3-5-1-0 outside of Colorado this season. The Roadrunners, meanwhile, have won eight of 10 games played at Tucson Arena. Forwards Travis Howe and Domenic Alberga, both signed to PTO’s last week, remain on the Roadrunners’ roster. Howe made his AHL debut on Saturday night, while Alberga registered his first AHL point. Recalled from the Norfolk Admirals on Monday, forward Darik Angeli is also with the team. 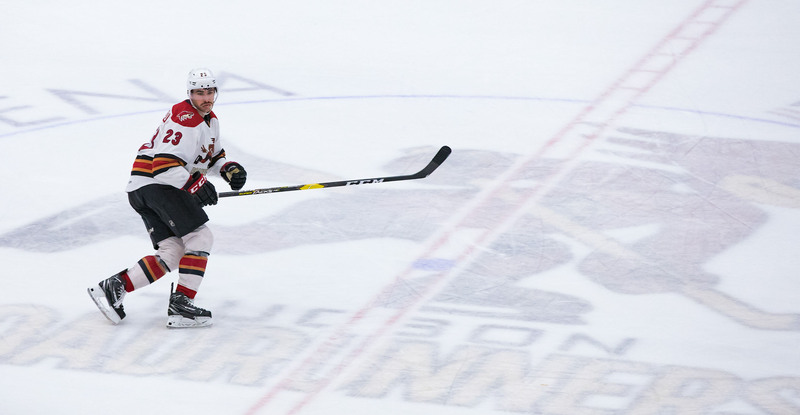 He played in both of the Roadrunners’ preseason games, earning an assist, before being assigned to the club’s ECHL affiliate, where he totaled 15 points (4G, 11A) in 23 games. DAUPHIN DAILY: Laurent Dauphin enters the night with points in his last seven games, mirroring that of the Roadrunners’ current stretch. He has amassed eight points (4G, 4A) during his current run and has scored goals in three straight. He has a total of 14 points (5G, 9A) in 22 games played this year, including an assist against Colorado on November 3. KYLE’S KILLING IT: Defenseman Kyle Capobianco is coming off back-to-back multi-point performances, including the first three-point game of his career on Friday night. With 18 points (2G, 16A) on the year, he is eighth among AHL defensemen in scoring and third in assists. He has points in seven of his last eight games, totaling 10 (2G, 8A) during that stretch. SECOND PERIOD SUCCESS: Without a doubt, the Roadrunners have done most of their damage to teams in the middle portions of games, outscoring opponents by a heavy 36-20 margin (+16) during the second period this year. On the flip side, Colorado has been outscored 24-17 (-7) during the middle frame this season. Can the Roadrunners gain some leverage with another strong second period tonight? FOUR: The Roadrunners are unbeaten in regulation when scoring four or more goals this season, which they’ve been able to do in 12 of their 22 games played thus far. When putting four pucks in the opposition’s net, they’re a striking 10-0-2-0. Colorado is 15th in the AHL in goals against per game this season, allowing an average of 3.17.